TCR is a heterodimer of an α and β chain, each with two Ig-like domains. This combination of the α and β chains and their Ig-like domains are analogous to the immunoglobulin Fab fragment. The chains have complementarily determining regions (CDRs). CD) is a short amino acid sequence in the shape of a flexible loop, found in the variable (V) domains of antigen receptors (e.g. immunoglobulin and T cell receptor). CDR3 region carries the most significant sequence variability in TCR, just like in an immunoglobulin. The variable β or Vβ region of the TCR is the binding site for superantigen. T-cell receptor complex with TCR-α and TCR-β chains. Image source: Wikipedia. 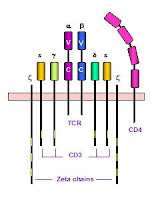 The TCR complex consists of the TCR, CD3 and two zeta (ξ) chains. CD3 has three distinct chains (γ, δ, and ε). CD3 deficiency is one of the multiple causes of SCID. The first event following the TCR ligation (binding) is the activation of Src kinases - autoinhibitory loop. CD45 phosphorylation in TCR signaling is of early and key importance. CD45 and ZAP70 defects cause SCID. ZAP 70 binds to the Zeta chain (CD247) of the T-cell receptor. ZAP-70 deficiency is a form of SCID (T-/B+/NK+), one of the few SCID forms with palpable LN. In ZAP-70, there are no CD8 cells and no T cell function, but there are normal B and NK cells. Syk is the ZAP-70 analog in B cells. TCR-APC Interaction. This video describes the process by which an antigen presenting cell interacts with a T cell. This video is from: Janeway's Immunobiology, 7th Edition Murphy, Travers, & Walport. Source: Garland Science. Lipid rafts are specialized regions of the cell membrane that are enriched for particular lipids and cholesterol, and consequently more rigid than the rest of the membrane. This video is from: Janeway's Immunobiology, 7th Edition Murphy, Travers, & Walport. Source: Garland Science. Immunological Synapse. This video describes the structure and function of an immunological synapse, the zone of contact between a T cell and an antigen presenting cell. This video is from: Janeway's Immunobiology, 7th Edition Murphy, Travers, & Walport. Source: Garland Science.